" BASKING IN SUNSHINE IN THE NORTHERN FOREST! " It was a very busy and a beautiful week here with warm, sunny days and cool nights continuing from last week. With this warm weather the snow is disappearing rapidly. Since I have been here, I have never seen such a string of warm, sunny days this early in March. But beware, we have had large snow falls in April! On Saturday, Steven Pluigers from P.E. I. came and picked up the team of dogs he adopted and they all headed back to their new home. This will be a rewarding experience with lots of adventures for both the dogs and Steven. 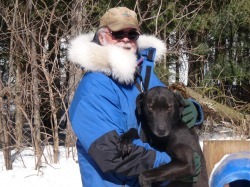 Welcome to the wonderful world of "mushing"! Saturday afternoon, the last 4 puppies were placed at their new homes in the adult kennel. Needless to say there was lots of excitement!!! Also this week, Cosmos ( brother of Goliate ) joined the Miortuk Team. He is adjusting well to his new home. This great weather is to continue into the following week.